Leave behind the boring junk food aisle and instead get the snacks you want, delivered right to your door. NatureBox, the smarter snacking delivery company, has over 100 delicious options to keep you satisfied. Join today and they’ll gift you your first box, complete with either 3 or 5 snack bags (depending on which box size you choose)! Simply sign up with NatureBox and pick your plan. You can choose between once a week, every two weeks, or monthly deliveries of either 3 ($13.95) or 5 ($19.95) full-sized snack bags, and then enjoy the fun of choosing your snacks. 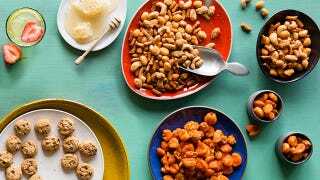 The variety of inventive snacks ranges from Sriracha Roasted Cashews, Mini Belgian Waffles, Pistachio Power Clusters and Watermelon Mini Stars. Get exactly what you want and say goodbye to artificial flavors, colors, sweeteners, trans fats, and high fructose corn syrup in your snacks. You’ll have total control of your snacking experience. And with NatureBox, it’s all delivered right to you. Sign up for NatureBox today, choose your favorite snacks, and the first box is on them. Available for new US and Canada customers only.